In honor of Women’s History Month, Clark Partington offers a four-part series focused on inspirational women. The featured quotes and the women who spoke them have had an impact on the authors of these blogs. In each blog, you will get to know the influential women in history, as well as two Clark Partington attorneys. This first blog was authored by Valerie Watson and Mary Grace Rahm as part one of a four part mini-series focused on inspiring women leaders. We hope you will be inspired, too! Women’s History Month is an opportunity to acknowledge that our careers and contributions to the community exist in part because of a number of extraordinary and tenacious women who made the decision to act. One such woman was Amelia Earhart. While well-known as being the first female aviator to fly solo across the Atlantic Ocean, Earhart was a trailblazer in a variety of respects. In 1935, Earhart became the first person to fly solo from Hawaii to the American mainland, landing in Oakland, California. With this flight, she became the first person to fly solo across the Pacific Ocean and the first person who had flown solo across both the Atlantic and Pacific Oceans. That same year, she became the first person to fly solo from Los Angeles to Mexico City, by official invitation of the Mexican government. Amelia Earhart’s self-determination transformed societal norms and inspired all people to chase their dreams despite any boundaries that may stand in their way. Our day-to-day work may not involve trailblazing, transatlantic flights, but each client we serve provides us with a unique occasion to take action and overcome obstacles. Every member of the Clark Partington team equates obstacles with opportunity and embodies Amelia Earhart’s can-do attitude. Valerie Watson practices in the firm’s residential and commercial transaction department. Her practice areas include real estate law, with a focus on real estate closings, construction law, HOA disputes, and insurance law. She also handles corporate transactional matters, with a focus on mergers and acquisitions, corporate formation and governance, and contract review. Prior to joining Clark Partington, Valerie worked with Louisiana residents after Hurricane Katrina to research property records and facilitate government provided assistance. The teams that she managed assisted thousands of families. Valerie can be contacted at vwatson@clarkpartington.com or 850-269-8863. Mary Grace Rahm is an associate in Clark Partington’s Commercial Litigation Department in Destin, Florida. 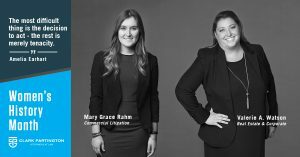 Mary Grace’s practice primarily focuses on general litigation, commercial litigation, intellectual property litigation, real estate litigation and personal injury litigation. As a native of Niceville, Florida and graduate of Collegiate High School at Northwest Florida State College, she feels that she has a unique opportunity to use her education to make her hometown a better place for the future. When she is not advocating for her clients, she enjoys paddle boarding and spending time with her rescue dog, Lincoln.She can be contacted at mrahm@clarkpartington.com or 850-269-8843.